Jahangir was the fourth emperor of the Mughal dynasty who reigned over India from the sixteenth to the nineteenth century. His reign is characterized by a consolidation of the Empire, he forms a transition between the conquests of his predecessors and the apogee of the Empire represented by his successors. Named initially "Salim Nûr ud-Din Muhammad", his name of emperor "Jahangir" means "Master of the World". He was born September 9, 1569 in Fatehpur-Sikri, a city created from scratch by his father to serve as capital, a city that was created following his victory over Goujerat and was abandoned 10 years later due to a lack of 'water. 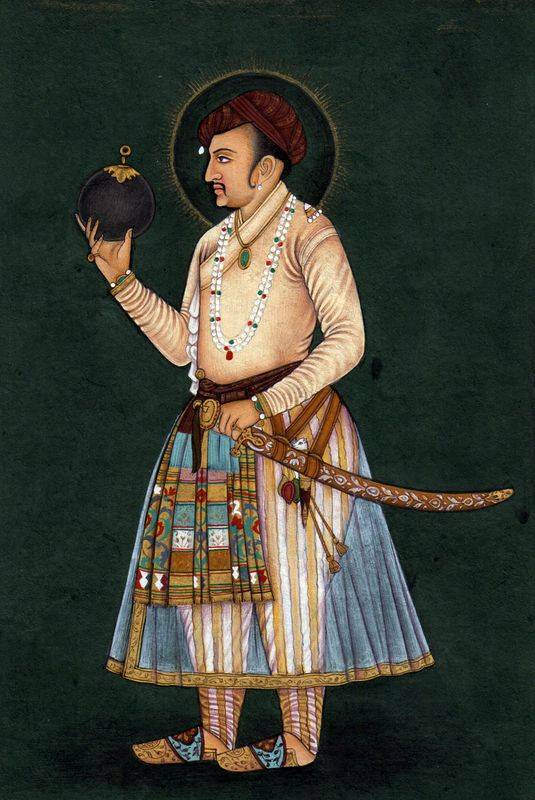 His father, Akbar, was the emperor who established the administrative foundations of the Empire. his mother, Miriam Zamani, was a Hindu, proof of the open-mindedness of his father who chose his favorite wife among one of the many minorities of his territory, of a different religious denomination (Moghols are Muslims). As a young prince, Salim was no different from his predecessors (or his successors, for that matter): He wanted to take over the Empire while his father was still there. History tells us that it was a common thing, each prince having tried, more or less aggressively, to overthrow his father. He was particularly active. At the age of 22, in 1591, he left for Allabahad and rebelled against his father, throwing his troops against him. Stopped in his approach, he will start again ten years later, in 1601, still without success. In 1602 he proclaimed himself king and had a coin coined, one of the symbols of the independence of a kingdom. He also had Akbar's secretary assassinated by a relative whom he would reward when he came to the throne. For all these facts his father Akbar had him arrested, but father and son came together through the widow of the Regent's widow, a man who had ruled the Empire in the days of Akbar's youth. In 1605 Akbar died, leaving the throne to his son. Jahangir's political life is closely linked to his personal life. Indeed, his wife, Nûr Jahân (originally known as Mihr un-Nisâ) was the wife of one of his Afghan officers who had been sent to Bengal as a local leader. But this one revolts and loses his life fighting against the Emperor. Mihr un-Nisa is then sent to the harem of Jahangir. The latter falls madly in love and they get married in two months, becoming the preferred wife and taking as such the name of Nur Jahan. Now she had a daughter (Ladlî), a brother (Afsaf Khân), and a still young father. All will have a life in relation to the highest positions of the Empire thanks to her. It must be said that little by little Jahangir sank into alcohol and opium, abandoning the political charges incumbent on him. The Empress's father was appointed to a key position in the government, the equivalent of a prime minister of the present European nations. The brother, Abu Hasan Hasaf Khan, take more and more power and becomes a very influential figure in the entourage of the Emperor. As for the daughter, Mumtaz Mahal, she will marry Prince Khurram, son of the Emperor and next ruler of the Mughals, some time later. He is known as Shah Jahan and it is for her that he will build the Taj Mahal. Jahangir has remained in history as a man of conquests. He opened several fronts, including that of Mewar, a province in the south of the Empire whose ruler, Amar Singh, ended up surrendering in 1613 to Prince Khurram. In the North there are two other fronts, one concerning the fight against the râja of Kângrâ, the other against the âhoms, which poses more problems to the Mughals than other peoples. 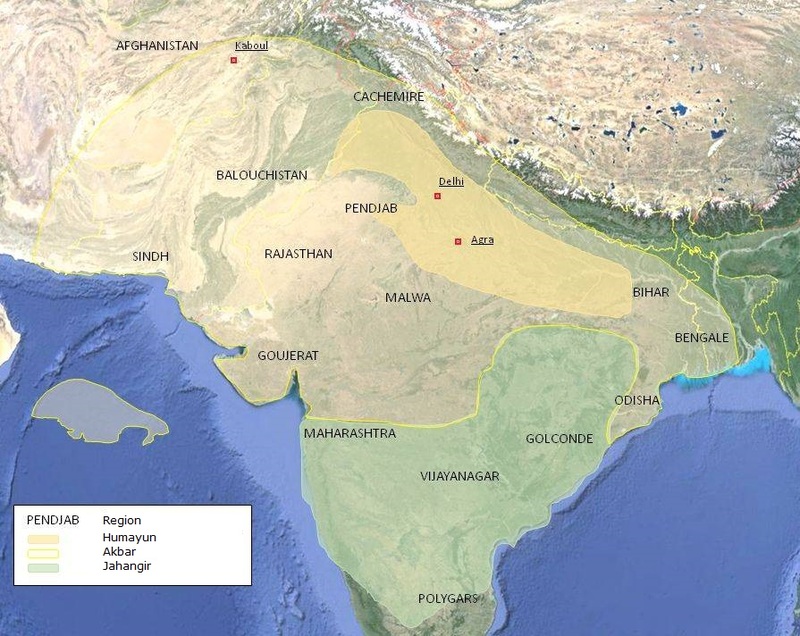 The Deccan is also the subject of a conquest. The Deccan is the central area of ​​India, rather to the South. It is a vast plateau whose peoples submit to Jahangir in 1615. Moreover, local peoples were not the only ones who could pose problems to the sovereign. Indeed, Europeans had the ability to move around the globe and wanted to set up trading posts on India, gateway to Asia. The Portuguese, the first to arrive, clashed with the Mughals, fighting raged in 1613. Shortly after the British surrendered themselves more oppressive, wishing to obtain permanent trade agreements. 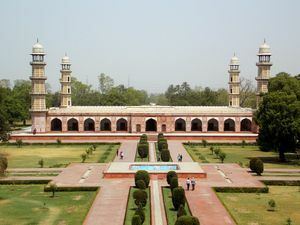 It was also at this time that a great of the Kingdom of England was sent to the Mughal course to establish these links. In this situation, the Empire is at its territorial peak, with a territory ranging from Afghanistan to Bengal and the Himalayas in southern India. But it was at this moment that two events occurred. First, an epidemic of plague broke out and ravaged part of the population of Northern India. To avoid being touched Jahangir went to Fatehpur-Sikri, the city built by his father to welcome his new capital, but abandoned soon after due to lack of water. The second event is more tragic: Jahangir shows signs of weakness. Fearing his death and therefore his removal from power, the Empress Nûr Jahân intrigues to ensure an heir who is favorable to him. She married her daughter to Shâhryâr, one of Jahangir's sons, whom he had with a concubine, hoping to have a son who could win against Khurram, who had become all-powerful and designated successor. These intrigues weaken the Empire and it is this moment that the Persians choose to seize Kandahâr. In front of this attack, Nûr Jahân demands from Khurram that he goes on the spot to take again the city but this one refuses, formalizing in fact his rupture with her. With his own troops he attacked the forces of his father, directed by Nûr Jahân, but he lost and was forced to return to the Mughal court under the conditions of the Empress, his daughter and son-in-law. Jahangir falls sick again. Khurram, seeing the end of his close father, rebels again. Jahangir, feeling threatened, fled to Kashmir. He died on the road, in Lahore, where he is buried. When Jahangir dies he leaves a rather unstable situation. Immediately his announced death Shâhryâr proclaims himself emperor, carried by Nûr Jahân who saw there his interest. But Shâhryâr was at Lahore with the Emperor, and by the time he returned to Agra, the brother of Nûr Jahân, Aşaf Khân, took over Khurram by placing a nephew of his, Bulâki, on the throne. What was to happen happened quickly: The troops of Khurram and Shāhryār's troops clashed, the victor recovering the Empire. It was Khurram who won the battle, so he quickly settled on the mohol throne under the name of Shah Jahan. Although unanimously considered cruel, Jahangir was a lover of the arts. He was fond of painting, music and architecture, mainly. The art of miniature was very advanced for a civilization of that time, even compared to the miniatures of Western Europe. From the beginning of his reign, Jahangir protected the artists and established in his capital a workshop which welcomed the artists who had his preference. The style of the paintings was not static, the artists representing a complex landscape as well as an intimate scene or an allegory. There was also a lot of work on floral or animal art.